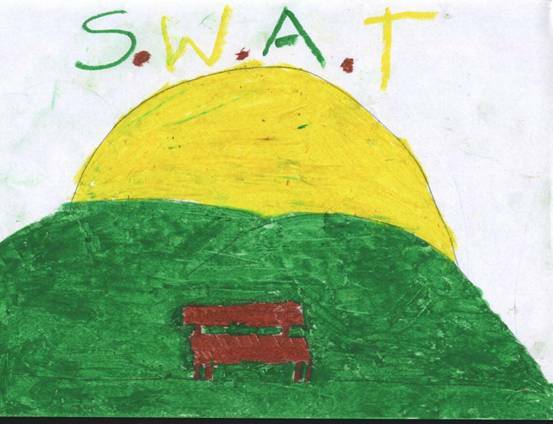 SWAT is a voluntary environmental group made up of people from all over Stewarton. It began in March 2004, after some initial work by East Ayrshire Woodlands and Lainshaw Residents Association identified the need and the opportunity. Although the name includes "Woodlands", the group has an interest in preserving and maintaining all the natural sites throughout Stewarton, including rivers and riverbanks, meadows and open ground, and all the flora and fauna that are part of them. The group's aims are to improve and regenerate the natural environment of Stewarton. This will have the effect of making the town a more attractive place to live or to visit, and also improve opportunities for people to make use of and enjoy the countryside for leisure and exercise. The improvement of natural habitats to encourage native wildlife and bio-diversity, and the availability of the habitats as an educational resource, will be important for present and future generations. Already, SWAT have developed a strategy for a sustainable network of linked paths around Stewarton. This will be accessible by all abilities and will form safe routes to school, for shopping, for dog-walking, cycling and for getting around the town. The rural hinterland of Stewarton is ripe for the creation of an outer loop made of linked paths suitable for multi-use, including horse riders, and those wishing to travel further afield on foot or bicycle. Chair - David MacKenzie. Vice Chair - Hugh Carty. Treasurer - David Ritson. Martin Picken, Eileen Adam, Jean McNulty, Joan Ingram and Liz Mackie.